I get to make a lot of very different pieces of jewellery as you can tell from this website. 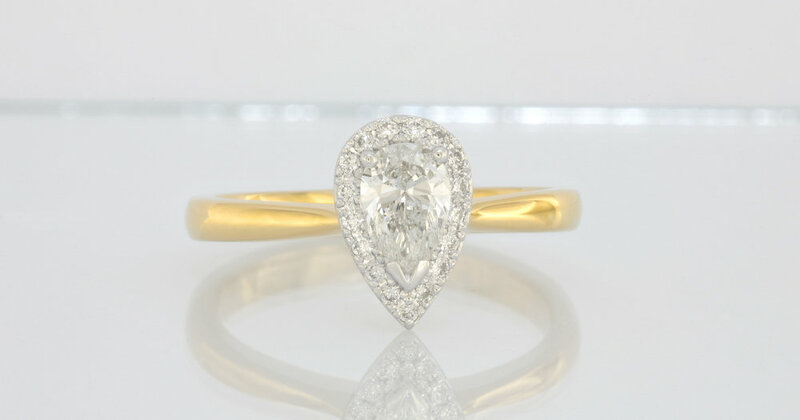 However a much larger portion of the pieces I create are more traditional engagement rings. Many of those rings start with a standard design of mine or one that has been seen somewhere else and it gets modified with little personal touches by the customer making it their own. This customer loved the halo in my DR994 using a half carat main pear cut diamond. She wanted to change the band however. Half round band with a taper to meet the halo. Designed to allow a straight wedding ring to sit next to it. A comfort edge was also added to make the ring as comfortable as possible to wear. What she did not like about the band was the diamonds set into it. She also did not like the fact that she would have to maintain the rhodium plating to keep it looking it`s best. She decide to go two tone gold and we designed a yellow gold band for her together. The draft ring made in Sterling Silver with the band gold plated. My next job is to meet with this customer to finish off the wedding ring design and since we planned ahead for this it will go very smoothly I would expect. No rough quotes for you!